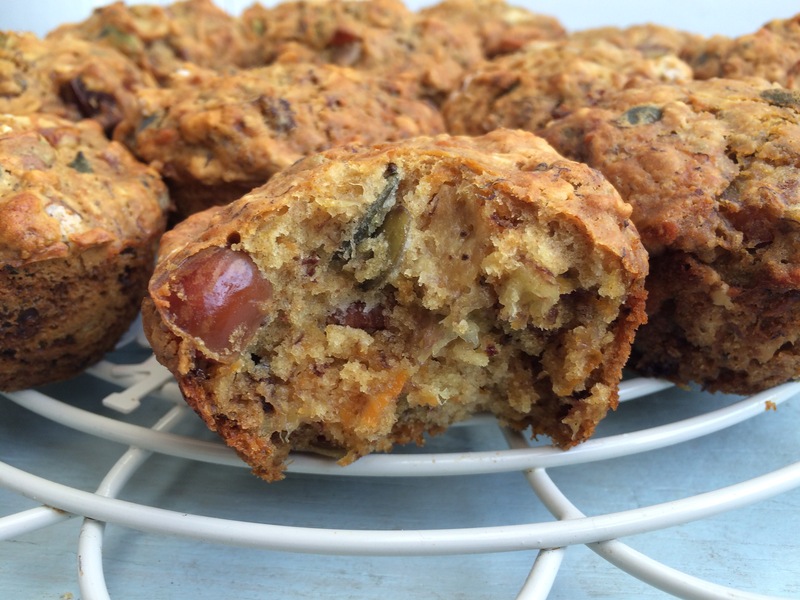 I’ve been looking for healthier breakfast muffin recipes because, who doesn’t love cake for breakfast, especially children. And if it’s lower sugar then you’re good to go. I haven’t tried this recipe with gluten free flour but I am sure it will work – you can also use gluten free oats. I am going to try to make them with buckwheat flour and will report on how well it works. This recipe is dairy free but if you want to use butter instead of coconut oil or milk instead of dairy free alternatives to milk. These muffins have no refined sugar in them – though they do have maple syrup which as a syrup is classified as sugar. I will be trying this recipe without maple syrup as I think they can easily be made without – 30ml contains about 15g of sugar which is equal to about 1.3g of sugar per muffin, the dates contribute 7g of sugar, the bananas provide just under 1.8g sugar per muffin, the coconut milk provides less than a gram. So in total each muffin has about 2 teaspoons of sugar which sounds like a lot but most shop bought muffins will be bigger portion sizes and contain 4-5 teaspoons of sugar, and they also won’t be in natural fruit form – which of course include lots of micronutrients, from vitamin B6 in the dates, to potassium in bananas. Under the latest Scientific Advisory Committee guidance this is equivalent to just over 1 teaspoon of refined sugars. We do have some sugar in our diet in our family and I want to reduce it. Have you found that children don’t notice any changes to what you feed them, if you don’t mention it and also make those changes gradually. In between work, parenting, and walking the dog I don’t have much time to experiment in the kitchen so I need tried and tested recipes that work, like this one. These make a great treat breakfast and of course can be put in lunch boxes too. 190ml coconut milk or almond milk or other diary free milk. Preheat your oven to 190˚C/gas mark 5/350°F. Put the mashed banana in a big bowl with the carrots, milk, maple syrup, vinegar and vanilla extract and melted coconut oil, mix well. Mix the flour, bicarbonate of soda, baking powder, mixed spice and salt. Gently fold in the seeds, nuts, dates and oats. Don’t over mix as this helps keep the muffins fluffy. Place the mixture in 12 muffin tins. Bake for about 25 minutes. You can test with a skewer and if it comes out with mixture on it bake for a few more minutes. Cool on a cooling rack for about 5 minutes or so. Serve with some chopped fruit and/or a cup of milk.